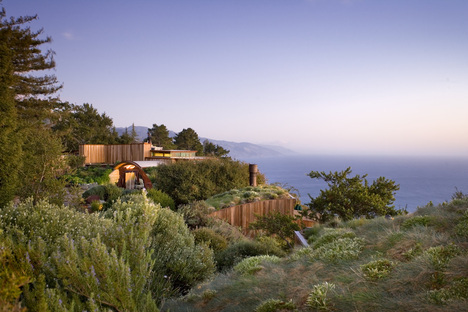 The mission of Post Ranch Inn in Big Sur, California combines the guest's desire for wellbeing with a sustainable facility and everything it offers. A delightful location 360 metres above the Pacific Ocean, number 1 on the list of Andrew Harper's 20 Favorite Hideaway Hotels. The hospitality for guests at the Post Ranch Inn in Big Sur, California, 150 miles south of San Francisco is so exceptional, the inn has been declared number on the list one of Andrew Harper's 20 Favorite Hideaway Hotels. Post Ranch Inn has 40 rooms and suites built to sustainable criteria, and each room gives guests a unique experience with ocean or mountain views. The whole project aims at making people feel part of nature rather than just observing it. To this end, all the buildings on the site underscore the connection and engagement with the environment. 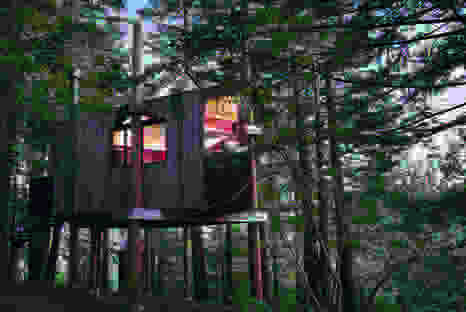 So, the Ocean Houses have grass-carpeted roofs that blend into the landscape and keep down the heat, while the triangular-shaped Tree Houses are elevated on stilts to protect the roots of the nearby redwoods and oak trees. The complex also includes Cliff Houses, Pacific Suites and the Coast House, all of which enjoy glorious views of the Pacific. The Peak Houses, Mountain House, Butterfly Rooms and the Post House (added in 2015), complete the offer on the mountainside. A master wood craftsman designs and builds guest room furniture in an on-property carpentry shop using often reclaimed, locally sourced timber or trees that fall on the property and redwood from wine casks. The organic hues, textures and extensive collection of original art inside the rooms blend seamlessly with the scenic beauty of the outdoors. The sustainable solutions include a solar array to generate electricity, the use of electric carts and hybrid vehicles, natural fabrics and soaps, waste recycling, a community outreach programme to raise funds for local charities and environmental initiatives, just to mention a few. Post Ranch Inn is the perfect destination for people who have the environment at heart in addition to their own wellbeing. All in a historical location since it opened in 1992 on the site of the Post family's cattle ranch, which was homesteaded in the 1860s. Billy Post, great-grandson of the original homesteaders, was involved in the creation of Post Ranch Inn, the architecture was designed by a famous local architect, Mickey Muennig - who better to interpret the spirit of the place.